Today is Halloween, which sets my mind on an eerie bike hunt giveaway in Denver back in 2001. It was my fourth attempt at a Bike Hunt and my first true giveaway. The scene that unfolded that cold early morning still reminds me of ghosts and that gut-wrench possibility of goblins. 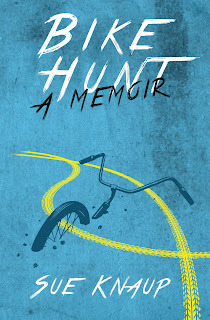 That’s why I’ve chosen the story of Rebel, a battered blue mountain bike with dodgy brakes, for the next in this series of excerpts from my recently published memoir, Bike Hunt. The frigid pre-dawn air smacked me as I stepped through the sliding glass hotel entry rolling Rebel at my side. Had I not had this urgent errand, I would have turned right around and headed back to my cozy room to wait out the hour before the airport shuttle would arrive. One hour to scan the unfamiliar streets of downtown Denver for the proper recipient of Rebel—a worn, but sturdy mountain bike I’d bought at a pawn shop two days before. October 2001, an early winter. This was the wrap up of my fourth Bike Hunt, my first deliberate giveaway. Pony, in Philadelphia, had inspired the hunt. Fifi, in D.C., had broadened my expectations. And Purple Flash, in Wenatchee, had sweetened it all with her giveaway. I had to get this one right. I’d been riding Rebel to the various meetings scheduled around a transportation summit for western officials and advocates. He was a good bike, brakes a bit sketchy, but he rolled smooth, shifted well, and actually came to a stop if I squeezed both levers hard. His blue paint was scratched through in many spots though I could see he was once a looker. The pawn shop owner had lent me the few tools I needed to tighten his hubs, adjust his stem, and rethread the left pedal that had nearly fallen off. I named him Rebel because he had obviously faced great odds, but he had a certain vigor to him as soon as I pedaled off, as if he’d hated being cooped up in that pawn shop. I donned my helmet (a bad habit I had back then) and started pedaling, fighting the urge to pedal fast against the cold. Granules of snow pelted my face and sugarcoated the few people out, walking fast, pre-rush hour. Even though this was my first deliberate Bike Hunt giveaway, I knew Rebel’s new owner could be anyone I passed. I needed to take it slow, study each face, find the one with a bit of sadness, something missing in their life. I turned onto the 16th Street Mall where I’d seen homeless people the night before laying out their blankets in doorways. The 16th Street Mall was formerly a traffic-filled city street, but it no longer admitted cars, only pedestrians, cyclists, and a free tram that moseyed down the center. This allowed me to zig and zag from doorway to doorway across the street and back. But I kept striking out. All I could see were mounds of blankets, cardboard, and newspaper with a bit of sugarcoating for effect. Come to think of it, if I’d slept in a doorway the night before, I sure as heck wouldn’t be throwing back my blankets anytime soon either, at least not until the sun was well up. And I wasn’t about to go up and nudge any of the mounds. Picture that: Nudge, “Hiya, do you want a bicycle?” Let’s just say that wasn’t an option. I checked my watch—only half an hour before I had to be back at the hotel in time to grab my things and bolt to the shuttle. The farther I went, the longer it would take to walk back. I was nearing the end of the pedestrian mall area with only the endless expanse of the unfamiliar city stretching beyond. I shook off the thought of failure. Only three doorways with mounds remained before I’d have to venture out into the untamed streets. As my heart sank with the prospect of traveling too far to walk back in time for my shuttle, I glanced to my right down a side street at an eerie scene. In the beam of a streetlamp, a billow of ghostly steam whirled up against the descending snow. At first, all I saw was the steam, then a dark shape and then all seven of them, palms pushing down as they rocked back and forth. Standing on my pedals, squeezing hard on the brake levers, I nearly fell over as Rebel eased to a stop. It took all my will not to ride full speed right at them and tell them how excited I was to find them. I carefully eased my leg over the seat, composed myself, and walked as nonchalantly as I could toward the group. They were about half a block away, time enough for me to practice my line, and then I realized I had a big problem—what if they all wanted Rebel? I stopped. No, it was my last chance. Time was evaporating with each hesitation. With careful steps forward I studied the group. They were Native American, likely a family, four generations. There was a boy, maybe four or five, too small for Rebel. There was an old woman, grey streaks in her long black hair held back with a turquoise-inlaid clasp, and an old man with a black cowboy hat and deep grooves in his face. They wouldn’t want him, would they? A middle-aged man draped with a colorful blanket hardly looked up, unlikely to get involved. That left the three who looked to be in their teens and twenties, one girl, the others guys. Still a problem. I kept moving, much less excited than a few minutes before. I decided to let it play out and follow my instincts, bail if I needed to. I walked right toward them along the sidewalk, carefully watching each face through the dancing billows of steam, especially the three. The old man stepped back, shielding the old woman. The kid squeezed between their legs. The three stood their ground. I kept walking. About ten feet from them I stopped. “Hi,” I said, and that’s all. I waited. But I didn’t have to wait long. One of the young men—maybe seventeen, Broncos team jacket, shoulder-length black hair, inquisitive expression—stepped forward. Problem solved. He would get Rebel. I delivered my story directly to him, not the others. I explained that I’d bought the bike to ride during a conference, but I needed to find him a home before I left that morning. He listened carefully with his eyes on Rebel. “Nothing, except your promise to take good care of him. I named him Rebel.” I wasn’t sure if I should have said this, but when he looked up at me and smiled, I was glad I had. “I’ll take good care of him, I promise,” he said as he reached out to touch the handlebar grip. I let go, so he had to grab it before the bike fell. He swung his new bike to his side, then crouched down to look at the wheels and gears. With that he stood and turned to the group, showing them his new ride. Though his back was to me, his elation was reflected in their faces. Then I remembered the lock, a new detail I’d added for this Bike Hunt. I’d brought an inexpensive coil lock to give away with the bike so the recipient wouldn’t have to worry about it getting stolen. The lock was dangling from the back of the seat, the key still in my pocket. I fished for it and brought it out. He turned around, looked down at my outstretched hand and back up into my face as if I’d offered him another million dollars. He took the key, speechless. That was it. Success. I was about to turn to leave when the old man, hidden behind the steam, abruptly spoke. It took me a minute to figure out what he was saying. A helmet, he wanted me to give his grandson a helmet. “That’s okay,” he said and paused to admire the bike with his grandson. “Thanks for the bike. He needs it. He’s looking for a job this week and this will help him. We need the money as you can see.” Then he slipped back behind the steam. I wished the young man good luck on his job hunt and in reply he held out his right fist. I’d never seen this before, but instinctively I made a fist and touched it to his before turning and walking away. Rebel’s Bike Hunt story is one of many throughout the book. I’ve got my eye on several more to share on this blog. All will have the label “Bike Hunt” so you can easily find them.